Chichester City Youth under-15s and Barnham Trojans under-14s are among local youth football teams celebrating trophies - while Bognor’s under-14s are on the verge of something special. In this second-versus-first clash, Chichester knew a win would seal the title. Pagham started the stronger but with no real end product. Chichester tried to take a hold of the game but the Pagham defence stayed strong. With ten minutes of the first half to go Pagham were awarded a penalty. Zak Cogger pulled off a great save and saved the rebound, giving Chichester the lift they needed. The second half saw Chichester take control and make the Pagham keeper produce numerous good saves. The goal Chi needed came when prolific striker James Vallis fired through a crowded box. Vallis nearly grabbed a second when clean through but Chichester saw the game out, making it 12 wins out of 12 to become deserved champions. It was a fantastic effort from all of the squad. Chi City: Cogger, Briant, Evans, Sutherland, Sanzen-Baker, Vallis, J Glanville, W Glanville, Dixon, Weller, Hadnett, Clarke, Silverthorne, Mill, O’Brennan. Barnham Trojans under-14s have won the Sussex Sunday League and cup. They clinched the title still unbeaten with three games to go. They went to Peacehaven for the cup final against Crawley, which they won 4-0. Week after week, the team turn up and play their socks off. A group of supporters accompany them and the support and respect they show each other really mould them into a fantastic team; they play for each other. Barnham: Jake Gibbs (captain), Enrique Andre- Paris, Toby Blanchard, Danila Gogu, Barnaby Griffiths, Evan Harris, Daniel Howick, Christian Kiddell, Raife Lock, Morgan Mockford- Allott, Jamie Norris, Kyle O’Brien, Samuel Pulley, Ben Romaine, Harry Terry, Alfie Hall, Matt Goff. Coaching team: Ernesto Andre-Paris, Mike Norris, Steve Menzies, Terry Gaunt- physio. One of Bognor’s youth teams are on the verge of something very special. We reported in January how far his group of boys had come over the years and how the were on the verge of reaching two finals and the possibility of winning their A division for the second time in three years. Bognor played Worthing United Youth in the semi-final of the Challenge Cup, winning 6-1 to claim their place in the final against Rustington Otters which will played on Sunday, April 22 at Nyewood Lane (4.30pm). They moved on to play Ifield Galaxy in the semi-final of the Sussex County Cup with a 4-0 victory securing their place in the Sussex County Cup final on April 15 at Lancing (2.30pm). The league has still to be decided and still in their hands. 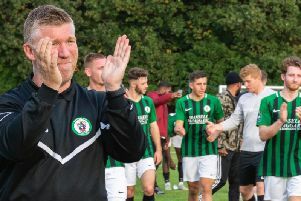 Manager Chris Hall said: “I’m lost for words at what they have achieved, I always felt one day they would be successful and I’m proud to say that they have delivered what I always knew they were capable of. Bognor under 13 Whites, for those currently in school Year 7 or 8, are looking for players to join the team. They train on a Thursday evening, 5.30pm to 6.30pm at The Arena, Bognor, with games on a Sunday. If interested, please contact Adam on 07758 162620.